Professor Andreas Neef researches strategies used around the world to survive in extreme circumstances, including disasters caused by climate change and land grabbing by foreign investors. 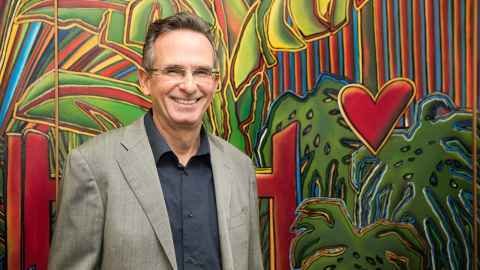 Professor Andreas Neef in front of 'Mount Eden Landscape' by Claudia Pond Eyley, 1984, University of Auckland Art Collection. "I have always wanted to understand how people adjust to extremely difficult conditions. I don't think outsiders make things better. So I never do research with the idea that 'I want to improve things here'. Instead, I want to learn from the people I'm interviewing and observing. "For example, I did field work for my PhD on customary land rights in Niger and Benin and had so much respect for the people there who were making a living from infertile soils in extreme climatic conditions while also dealing with health issues like malaria. Western people like me wouldn't be able to survive three to four months on our own in those conditions. "Following the completion of my PhD project, I lived in Thailand for nine years and have studied land and water rights in Southeast Asia and the Pacific. "I am critical of the mainstream school of thought that says 'we need to introduce western-style private titles to communally-held traditional land'. Their idea is that countries in the West have succeeded because individual owners can take land titles to the bank and use them as collateral to get credit." I don't think outsiders make things better. "My response is that communal land rights make more sense than individual land rights in certain situations, particularly in risky environments where people rely on communal structures and assistance. "In addition, land grabbing by foreign investors is a problem in countries with relatively weak land governance structures. Investors say 'subsistence is primitive and backward — agriculture needs to change to large mechanised farms. We need to industrialise if we're to feed the world.' But that's bogus — a false claim. "For example, farming in countries like China and Vietnam is both extremely small scale and highly productive — farmers work their land intensively. Large-scale farming might work in countries like the US but it's monocultural and comes at the expense of biodiversity. Investors say 'subsistence is primitive and backward — agriculture needs to change to large mechanised farms. We need to industrialise if we're to feed the world.' But that's bogus — a false claim. "Natural hazards provide other examples of where land held communally offers advantages. People in the Pacific often have strong ties to their land, and moving outside of their own ancestral land is far more difficult than moving inland within it. "When Cyclone Winston hit Fiji in 2016, people in one village had to hold their kids for hours above their heads in the community hall so they wouldn't drown in the flood. Understandably some were traumatised and wanted to move to higher ground. But it is hard for them to move inland because, in a rare case for Fiji, the land inland is owned privately and the owners refused to give up their land to accommodate the community. Several community leaders have emphasised the Pacific values of reciprocity and collaboration, and how their ability to connect with other Pacific communities could help in the event of a major disaster in Auckland. "I research disaster resilience of Pacific communities in Auckland with Associate Professor Jay Marlowe from the Faculty of Education and Social Work. This research is useful to our understanding of the transnational character of disasters in the Pacific and how Pacific communities have unique capacities and experiences in disaster risk management. "For instance, several community leaders have emphasised the Pacific values of reciprocity and collaboration, and how their ability to connect with other Pacific communities could help in the event of a major disaster in Auckland. "In my future research, I want to find out what happens after successful resistance to land grabs, particularly among indigenous communities in rural Cambodia. Many scholars regard this as a happy ending, but for me it's a new chapter. Will the land be returned to the rightful customary owners or will the process of land restitution be compromised by powerful local elites? This research may turn out to be of interest for New Zealand's Māori communities, as a comparison to their own experiences."